For years, we have been helping Maryland clients improve the functionality and aesthetics of their homes by providing specialized home improvement services like bathroom remodeling. We primarily serve the Eastern Shore, particularly Kent Island, Annapolis, and Chester areas. If you also want to experience the highly personalized service that we have been providing clients in these areas, please call us today. Our creative designers and expert installers can transform your existing bathroom into a relaxing, cozy, and beautiful haven. Our bathroom remodeling experts will offer you a carefully planned bathroom design with all the features and amenities that you desire. Our team will sit down with you during the initial phase of the project to allow us create a customized design plan. It may also involve a series of meetings on site and visits to our showroom so we can fully understand your ideas and desires. This process may take some of your time, but you will be guaranteed of a perfectly remodeled bathroom. We have already created several designs for our clients from Kent Island, MD, and all of them are impressed with the results. At 314 Design Studio, we can work on simple changes or additions to comprehensive bathroom remodel. Our team can replace your old vanity mirror with a new one complete with accessories that you need. 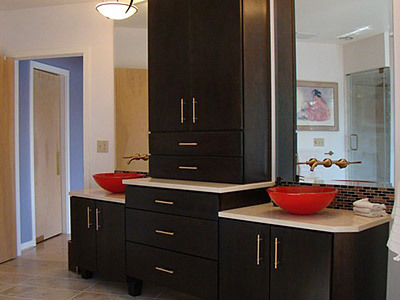 If you need a larger storage area for your bath towels, toiletries, and other bathroom essentials, we can install exquisitely designed cabinetry from our partner suppliers. We can also install new and modern lighting fixtures to improve illumination in this area. We can even create a certain mood to give you a more relaxing bathroom experience. We can likewise install new bathtubs, spas, and other bathroom amenities that you may need. Meanwhile, if you want a major transformation in your bathroom, we are also the perfect contractor for the job. We can expertly handle all phases of the remodeling job because of our experience and professional crews. In fact, most of our bathroom remodeling projects in Kent Island and surrounding areas involve complete bathroom remodels. From installing decorative tiles and custom vanities to adding new lighting fixtures and cabinetry, we can work on them with commendable results. Our primary aim is to create bathrooms that are not only stunning but also functional. We ensure that all our creations or additions can last for decades without needing replacement or major repair. From flooring materials and cabinets to lighting fixtures and bath accessories, we all source them from leading suppliers and manufacturers. Some of the brands that we use in our bathroom remodeling projects include Kohler, Houzer, Grohe, GelPro, Danze, Aristokraft, Plato, and Woodharbor. These companies provide us with top-of-the-line products that will surely suit the discriminating taste of our clients. They also help us create the perfect bathrooms for our clients because of the wide range of choices available. Their products are all exquisitely designed and packed with modern features. If you want a successful bathroom remodeling project, only trust in a company with decades of experience in home remodeling like us at 314 Design Studio. We have creative designers and expert installers who can work on your desired design and install the features and amenities that you need. Call us at 410-643-4040 so we can discuss the specific details of your project.